We’re looking today at three faith shortcuts that get you nowhere. All three are shortcuts every single one of us is tempted to take. All three are shortcuts we all actually take, and you might find yourself on one right now, and it’s leading you nowhere. No one loves a good shortcut or hack or life hack more than me. I’ll tell you about some of my favorite hacks this weekend. My favorite shortcuts or hacks are fun or relatively insignificant, but some hacks are not so good. Imagine a surgeon trying a new shortcut procedure he picked up on Youtube! The 3 faith shortcuts that lead to nowhere can be discerned by reflecting on Jesus’ crucifixion. That’s our passage this weekend. That’s a shortcut. That’s a hack. And it was a temptation Jesus faced from way back in his ministry. Satan tempted Jesus to take a shortcut and bypass the cross. So we’re looking this weekend at Jesus on the cross and reflecting on how we too are tempted to take faith shortcuts. Ever wondered who takes the time to create the artwork on the chalkboards in the Commons? 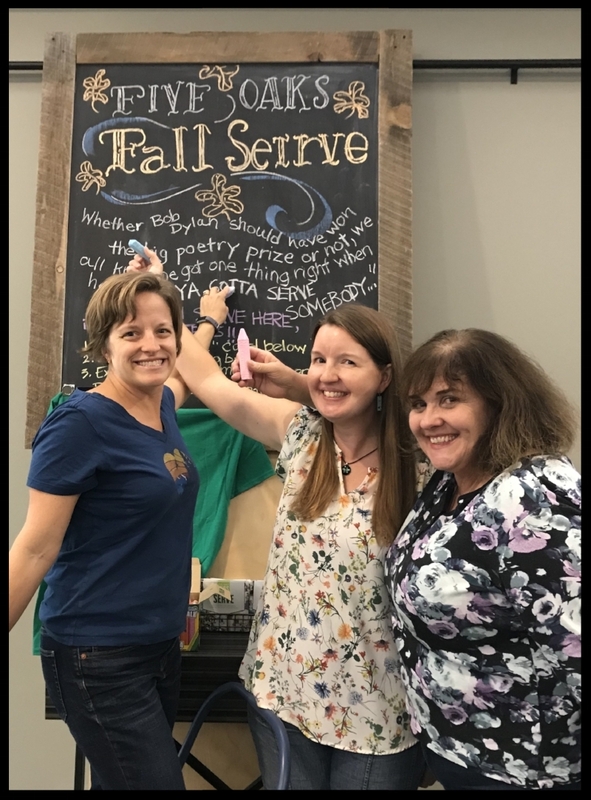 This team of artistic ladies take turns coming in to Five Oaks on their own time and creating the artwork and messaging we need each week! Fun fact: Because each chalkboard weighs nearly 40 pounds and is rather unwieldy, the artists create their works while standing on a ladder! They are creative and generous with their time, and the ones with young kids bring them along to “help,” too. Pictured here, from left: Bethany Nordman, Meleah Miller, and Liz Snow. Not pictured: Patty Gorter and Emily Korf.